Is fishing a way of life? If you answered yes, we know you’ll fit right in on one of our Shack Attack fishing charters off Cervantes! We have been living and breathing the fishing lifestyle here at Lobster Shack for the last 60 years and we will happily continue to do so for the next 60 years too. If you’re on a road trip and didn’t bring your fishing gear, have no fear because we’ve got you completely covered. We provide you with all of the gear, bait and tackle and we’ll even feed you! 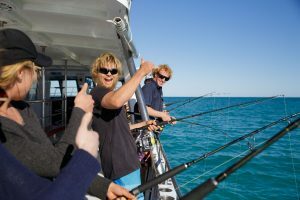 The fishing charter goes for around eight hours so we’ll definitely be providing food and refreshments along the way. The only thing you have to do is show up ready for a big day. Our Shack Attack Fishing Charters leave the Cervantes jetty at 6:00am and return at around 2:00pm in the afternoon. 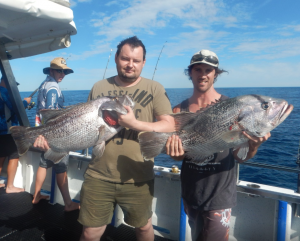 We operate the charters all year round except for on Christmas Day and during the Government Fishing Ban. If you’re in the area, you can also check out our dedicated Facebook Page for updates when we have spots available on upcoming trips too. You can check to make sure you’re on top of the seasonal updates for WA fishing bans here. These bans are put in place for the protection of some fish species during specific times of the year. 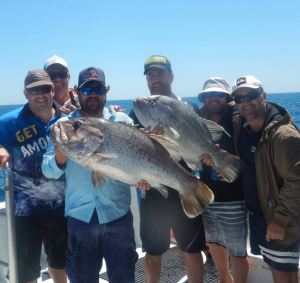 Our qualified and fishing-obsessed staff will be on board with you, showing off the best fishing spots so you can hopefully bring back the Big One! It’s always a fun and unforgettable experience with a small group of just 15 people per charter. We have loved hearing so many good things from our recent fishers too! Rob V left a review on our Facebook Page saying “Best Charter I have ever been on!!! Very professional in all aspects from the beginning to the end. Highly recommended!!!”. Joey P also had an awesome day, mentioning that he “Had an awesome day out on Shack Attack. The boat had plenty of room to fish with hardly any tangles. We moved around a lot to find the fish and once they were on it was non stop action. Definitely one of the best fishing charters I’ve been on. Would recommend and go again!”. Know a fishing lover with a birthday coming up? Or maybe you just need an excuse for a boys trip? Book your next fishing trip with Lobster Shack here and get ready for an epic day of reeling. Prices start from $270 (everything included).